DVD enthusiasts are never stingy with their money when it comes to DVD. On the contrast, they will immediately make DVDs of their own at all costs. Although 2012 becomes a thing of the past, the best DVD movies 2012 become odds on for these DVD zealots. To help out a little, here’s my pick of top 10 best-selling movies on DVD in 2012. Note: If you are madly cling to these wonderful DVD films and do not want them to be easily scratched or unused, why not copy the best Hollywood movies on DVD for forever keeping. To do this job, MacX DVD Ripper Pro is your ultimate choice, enabling you to copy the top-notch DVD movies from 2012 on your Mac and rip DVD to MP4, MOV, FLV, AVI, etc that are optimized for portable devices, so that you can view the digital movies on iPhone, iPad, iPod, Android, etc anytime anywhere. MacX DVD Ripper Pro offers one-stop solution to rip DVD movies from Hollywood, Bollywood, Disney to MP4, MOV, FLV etc., bypassing all kinds of DVD protections like CSS, region code, RCE, Sony ArccOS, UOPs, Disney X-project protection etc. Below is a list of 2012 top 10 must-see DVD movies with regard to units sold, sales revenue and DVD release date. And you will have a detailed look of the new movies on DVD in 2012. 1. 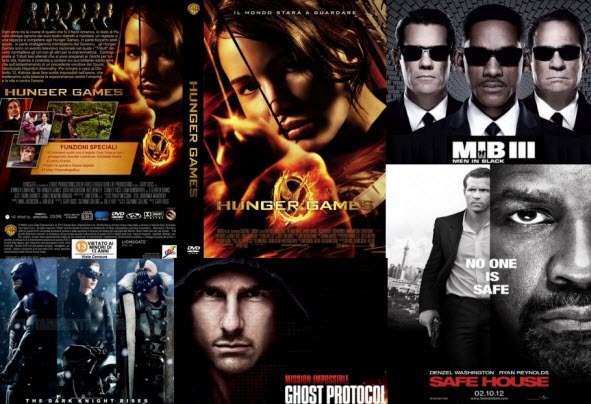 The Hunger Games: Definitely, 2012 is the year of The Hunger Games which is for sure to be the most sought-after DVD movie you’ve ever seen in 2012. Though a pint-sized movie buff, The Hunger Games creates quite a stir ever since its first appearance in both theaters and DVD stores. It’s no surprise the units sold came to 7,434,058, ranking first among the top 10 best DVD movies in 2012 in a breeze. If you prefer to download the best movie 2012 to Mac, PC,iPad, iPhone, iPod for your kids, do not forget to convert the video so that your iOS device could play (click to see the YouTube to iPhone tutorial). 2. The Twilight Saga: Breaking Dawn, Part 1: Opening with Bella and Edward’s much-hyped wedding scene, it works. By virtue of the romantically touching love story between Bella and Edward, Breaking Dawn, Part 1 again proves this is really a series of the highest quality and wins the silver award as one of top 10 must-see movies released on DVD 2012. 3. The Avengers: If you think this flick is just some kind of marketing stunt and isn’t worth your collection, you are wrong. Actually, it is said to be one of the best super-hero-themed DVD movies in 2012. For me, I really have to give the credits to Joss Whedon who managed to put all the heroes like Captain America, Thor, Iron Man, Hulk and more, all in the same film. Even though its DVD’s released on late September, 2012, people’s craze about it seems to make the DVD movie the best-selling among this massive DVDs. 4. The Dark Knight Rises: For those who’re bound up in watching Batman flick, The Dark Knight Rises is of course the best DVD movie to watch in 2012. The plot involves the whole of Gotham descending into anarchy and mob rule, while Batman is put out of action. This farewell to the Batman remains the best DVD movies 2012 and it is absolutely and definitely worth your DVD collection. 5. 21 Jump Street: when talking about 2012 best DVD movie in comedy genre, 21 Jump Street fully deserves the first rank. Even though on paper it really sounded like a disaster, the outpouring laughter all through your watching the flick still proves it merit the reward. Indeed, this DVD movie is a genuine success, against all expectations. 6. Mission Impossible - Ghost Protocol: Yes, in 2012 Tom Cruise is back with his the new DVD movie Mission: Impossible - Ghost Protocol. Like the former three installments in the Mission: Impossible series, this DVD movie still stands high in popular favor and successfully enjoys a sales revenue of $22,572,766, making it one of 2012 top ten DVD movies. 7. Ice Age: Continental Drift: A most sought-after DVD movie for people who want to experience an adventurous journey. This movie is surely one of the top DVD movies this year that offers the best way to get you indulged in epic seafaring quest, exotic sea creatures, ruthless pirates, etc. 8. Men in Black 3: This 2012 movie won $54,592,779 just in the opening weekend, signifying its popularity in the filmdom this year. Without any question, as a moviegoer, you’ve ever lied on the couch and watched this best DVD movie with your loved ones at home. 9. Act of Valor: For those who are full of zeal and desperate for excellent war flick, Act of Valor is the best movie released on DVD in 2012 you cannot miss, bringing you into a thorough world of heroes who are trying to stop an international terrorist. 10. Safe House: This film also deserves to be one of the top ten best DVD movies 2012, since this star-studded thriller is an unexpected box-office hit, grossing about $125 million in the US alone and nearly $200 million around the world. So it’s a good idea to make its DVD your own so as to maintain good video and audio effect of this film.